Hall Piano Company delivers 15 pianos to the LSU School of Music through the George Rodrigue Foundation. 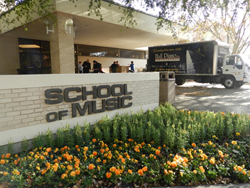 On Sunday, November 29, 2014, Hall Piano Company delivered 15 Steinway pianos to the LSU School of Music as part of the fulfillment of a plan by the Rodrigue Foundation of the Arts, and with additional support by Hall. The foundation purchased the pianos, valued at $125,000 altogether, with proceeds raised through sales of a posthumous, limited edition print. The 31-by-26-inch print features Rodrigue’s iconic Blue Dog in black tie sitting at the keyboard of what appears to be a Steinway piano, the same baby-grand style of Steinway that the late Louisiana artist turned into art in 2012 to benefit the LSU School of Music. While meeting with then Dean of the LSU School of Music, Dr. Larry Kaplain, Steve Kinchen, co-owner of Hall Piano Company, Steinway’s exclusive representative in South Louisiana, offered to donate a restored Steinway Grand Piano (an $80,000 commitment) to be specially painted with a design promoting LSU. Eventually the piano was to be auctioned off and the proceeds directed to the LSU School of Music “All Steinway School Initiative”. Painting the instrument in 2011, Rodrigue covered it with Blue Dogs and bright psychedelic swirls after the School of Music’s former director of development, Steve Covington, approached the Rodrigue Foundation with the idea. Unveiled on Nov. 10, 2012, in the Pete Maravich Assembly Center before the LSU-Mississippi State football game, the piano has since traveled throughout Louisiana, and been played by musical notables such as Billy Joel, Dr. John and Allen Toussaint whose autographs can be found on the piano’s inside plate. Wanting to fulfill their commitment to the School of Music, foundation representatives sought out and received permission from the original painting’s owners to issue the limited edition of “Take Five”. The only George Rodrigue print featuring Blue Dog and a grand piano, "Take Five" is a Limited Edition (950 prints) released posthumously. Each is numbered and stamped with a specially designed Rodrigue signature in propriety ink to denote authenticity. Rodrigue Steinway “Blue Dog Piano” Restoration Details: Steinway Serial No.163367 belongs to a New York Model “A” Mahogany, 6’2” in length, 7 1⁄4 octaves (88 keys), wide tail, completed on November 18, 1913, and shipped to the Steinway dealer in San Francisco, CA on March 6, 1914. Hall Piano Co. completely restored this piano to its original condition using 100% genuine Steinway parts. The action rebuilding was done by Poppy Miles who is a graduate of North Bennett St. School of Piano Technology &amp; Rebuilding, and president of the New Orleans Chapter of the Piano Technicians Guild. The belly work of the piano which consists of soundboard restoration, installation of new wrestplank, strings and tuning pins, hitch pins, agraffes, duplexes, and all associated felts was done by expert rebuilder of 25 yrs., Mr. Thomas Larson. Mr. Larson was also responsible for the regilding of the plate and detail lettering on the cast-iron frame. All cabinet restoration, case prep for artwork, and beautiful ebony satin finish was done by master refinisher, Mike Gillon. This included extensive cabinet repair, original finish removal, sanding, filling and leveling of primer coats, and concluded with 7 coats of Steinway &amp; Sons satin full-bodied heavy black lacquer which is allowed months of curing time before the time consuming process of polishing out the cabinet. Final concert preparation of A-163367 was performed by Steinway Concert Technician Mr. Matthew McWilliams. This includes an exhaustive 27-step concert preparation of all 6400 moving action components to ensure the highest level of playability of this piano. The digital reproducing system installed by Hall Piano Company is a QRS PianoMation II system complete with PNOScan digital recording interface and will allow for recording of the many fine performances that will occur on this piano. Hall Piano has been a leader in the installation of computerized reproduction systems for over 35 years. Hall Piano Company has served the region since 1958. As south Louisiana’s premier Steinway &amp; Sons dealer, their services include piano rentals and sales, acoustic and digital piano sales, piano lessons and method books. For additional information about the LSU School of Music installation or the Rodrigue Steinway "Blue Dog Piano" contact Emily McWilliams at emilym(at)hallpiano(dot)com or call 504.733.TUNE.